Khazeena never felt like she had to come out to anyone. My sister has always known she was a lesbian and never once treated her sexuality as anything different to the rest of herself. It’s Sunday morning and we’re sitting in our mum’s living room in Birmingham. She’s three days into her first visit to the UK in almost five years and jet-lag is still an issue. She requests having something on in the background as we chat, so we settle on vintage episodes of The Simpsons. A lot has happened since the last time we saw one another. Our eldest sister is now married and living down the road with her husband. Mum has retired and spends her time doting over the family cat. In 2014 I came out to the family and moved away to London. “If you look at the way we grew up, it was pretty obvious we were gay,” she says with candour I’m not used to seeing from her. She thinks back to how she hung out with the boys in school, enjoyed sports and didn’t dress particularly girly. Whereas I would hang out with girls, play dress-up and enjoyed wearing nail polish. I furrow my eyebrows for a moment and then look at my own nails. They are currently painted metallic grey with glitter on the tips – I guess she has a point. “Do you think we cancel each other out in that case?” I ask. She laughs. I take that as a yes. It’s the first time either of us have spoken openly about both being gay. I’m keen to find out what it was like for her growing up because as kids we were never really close. At 18, she left home for Camp America and that kick started years of travelling across the world. America, Canada, Asia and now finally she’s settled in New Zealand with a job, friends and access to her beloved gym. At 33 years old, she says she finally feels like she has roots. 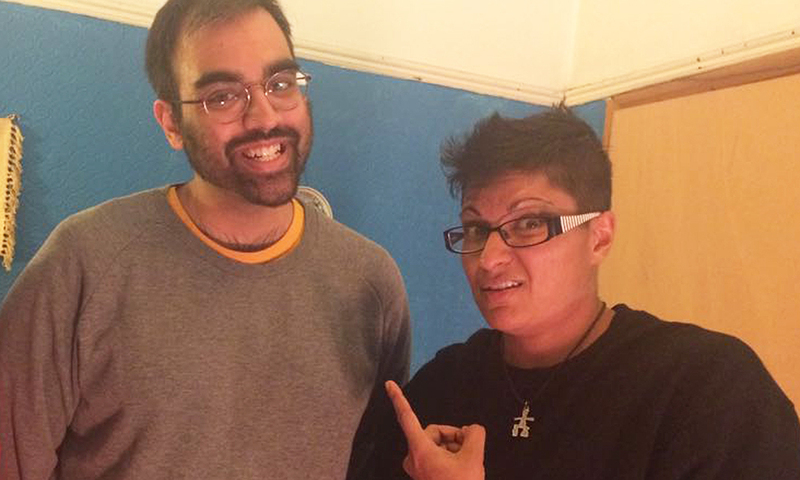 I ask whether coming from our Muslim family had any impact on her growing up gay. Khazeena smirks at the mention of being Muslim and I can tell she’s eager to nip this one in the bud. She tells me she doesn’t consider herself Muslim and never has, but there’s no resentment or anger in her voice. “Our parents were raised Muslim, but we weren’t and I’m not,” she concludes. It’s a fair statement as our upbringing wasn’t exactly traditional. Mum divorced Dad when we were kids and she raised us on her own, which for a Pakistani woman to do was considered revolutionary at the time. Most of what we know about Islam is through our extended family. They’ve tried in earnest to educate us on God and the Day of Judgement with very little success. At the mention of religion she stops herself and asks whether ‘He’ knows about me being gay. He doesn’t know about me, I say, but I plan to tell him. Her body language shifts, she sits up straighter, but not comfortably. I can tell she’s listening but she averts her eyes to the TV and her responses become short and hurried. I’m not surprised by her reaction and I know from experience to tread lightly when talking about him around her. She’s told me before how she’s unable to be herself around our dad. He’s a painfully traditional Pakistani man. He’s concerned about image, reputation and social standing, more so than his children’s emotional wellbeing. It also doesn’t help that he’s grossly homophobic. A day earlier she mentioned in passing about emailing him a while back explaining everything. She told him how he makes her feel and why she finds it hard to talk to him. I’m hopeful at first, but she shrugs and says he ignored everything she said in the email and made excuses for himself. She hasn’t bothered contacting him since. I move the conversation on and I learn more about her life in New Zealand. She frequents at a bar called ‘The Ivy’, but the LGBTQ+ community is non-existent where she lives in Wellington. I respond sympathetically but she reassures me it’s not the worst thing. “I don’t have to be around gay people all the time you know,” she says jokingly. We briefly touch upon our aunty from Mum’s side of the family. She’s a lesbian too and I wonder if seeing how hard it was for her after she came out to her own mother – our grandma – scared my sister into thinking she’d have the same experience too. Without missing a beat she says it had no bearing on her whatsoever. Speaking candidly now she reveals how she finds our aunty annoying and never once wanted to confide in her about being gay. I begin to laugh because I know exactly what she means. My sister is definitely a lot more confident and sure of herself than I ever seen her. It’s nice to see. At the risk of projecting my own struggles on her, I ask if she’s ever found it hard to be gay and happy. Almost before I can finish asking the question she nods, but never because she was gay. Being gay was always “the good thing” in her life, it was everything else around her – friends, crappy jobs and living at home – that she found difficult. We’ve been sitting here for over an hour and I can see she’s getting antsy so I wrap things up. Mum’s asking when we’ll be done so she can start on cooking breakfast. It feels like we’re both kids again. And I’m guessing that includes me. 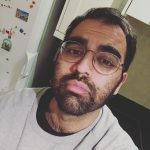 Yusuf is a full time pop culture aficionado and writer with an undying love for Britney Spears and an irrational fear of jockstraps.